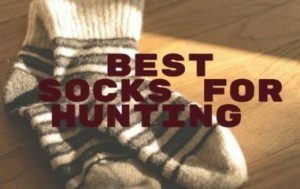 Best Hunting Socks 2019 | For Making Your Hunt Efficient! If you’re heading out hunting then you need to know how to prepare for what’s out there. It’s not just about taking along your bow or your rifle to be prepared for the animals you’re trying to hunt. You also need to make sure you’re prepared for the cold weather that you’re going to encounter. What that means is from your head down to your feet you need to be ready for the cold. That means you need warm underclothes, pants, shirts and everything else, including your best hunting socks. These socks are actually antimicrobial and feature a soft, Merino wool lining. They are unisex and they come in a variety of different colours and sizes to make sure they fit anyone. They even have a reinforced toe and heel to make sure you get plenty of wear out of them. What’s even better is they’re designed to be comfortable to wear over the long term and they’re easy to clean because you can put them in your machine either cold or warm as long as you flip them inside out. Then all you need to do is hang them up to dry. They are designed to fit midway up the leg to provide a good amount of comfort and warmth through more than just the foot. They also have a variety of colour options to fit your preference and are even made in the USA. Lightweight and inexpensive, these are socks that you can definitely wear for anything and stay comfortable and you won’t have a problem getting good quality that you’re looking for. These socks are considered a heavy sock and are made with wool to provide even more warmth. They come in three different colour options as well as a variety of sizes and are created specifically as a men’s sock. They’re made with a mix of mainly wool and nylon though there are a little spandex and other materials included to make them fit snug and easily. They have an ultra-stretchy material all the way through and a tighter elastic band around the foot and the top of the sock. It has extensive thermal regulation and also uses FastDry Technology to help get rid of sweat. Because of the stretchy material at the top, it’s a tight fit and you don’t have to worry about bunching at the top of your boot. It also uses odour control to make sure there’s no smell and you can easily put them in the washing machine to get them clean and ready for your next outing. You’ll be able to stay warmer when they are paired with thick boots. These thermal socks are inexpensive and come in several different colours. They are also eco-friendly, made with recycled cotton. They’re fully cushioned all the way from the base of the foot up the leg to absorb shock as well as keeping you comfortable while walking for a long period of time with hiking boots. These boots are designed to be unisex and are mad with polyester and recycled cotton. They are slightly shorter than the other socks mentioned here, but still, come up over the ankle to provide plenty of comforts. Warm enough for colder weather, these socks are also very breathable so you can easily wear them while you’re sweating as well. They fit well with standard boots and though they aren’t moisture wicking they can still keep you comfortable and relatively dry while you’re hiking or backpacking. They’re also easy to wash and wear because they are made of cotton and polyester. Made mostly with Merino wool and nylon, these socks are extremely heavy and provide a lot of cushions for you to walk around long term. They have braces through the ankle and arches so you get plenty of support while you’re moving. You also get a flat toe seam that’s more comfortable on your toes. Not only that but the socks are entirely made in the United States and provide high shock resistance and warmth in cold weather. With these socks, you’ll be able to hunt for a longer period of time because you’ll have no problem with the cold through your boots and these socks. Because they are unisex, you’ll be able to wear them no matter what. You’ll also be able to wear them long term because they are over the calf and lightweight. Because of the makeup they are moisture wicking and capable of keeping you dry. The first thing you need to know is how to choose the ideal socks for your hunting excursion. It’s not just about pulling a normal pair out of your drawer and getting on with your day. You need to look at a few very important aspects first, and those are going to include things like material, scent blocking, thermal makeup and overall comfort, in whatever range of importance you find best for you. The most important thing is going to be how comfortable your socks are. If you don’t have comfortable socks you’re definitely not going to want to walk around much or even sit in your blind. You’ll want to go right back home and change again. So make sure whatever you get is comfortable and soft. Next, make sure that your socks are going to keep you warm. Remember that you’re going to be outdoors and it’s going to be cold. You definitely don’t want to be struggling to keep your feet warm because you’ll find yourself a whole lot colder right from the start and that makes it hard to stay out very long. This is a slightly different aspect that you want to consider and has a couple different parts. For one thing, you want to make sure that the socks you choose are antimicrobial, so they’re going to keep you from chafing because of sweat or moisture and also so they’ll keep wicking away that moisture as you go. You may also want socks that eliminate odours entirely, which is an additional aspect you will want to consider when choosing your socks. There are all different types of material that your socks could be made of so you want to make sure you’re looking at each option. Cotton is generally not good for this type of purpose, but acrylic will be water wicking and usually anti-microbial as well. That makes them a better choice for your hunting socks. Overall, finding the best hunting socks are going to be crucial to you being comfortable and warm while you’re hunting and any of these socks are definitely going to help you with that. By staying warm and, even more than that, staying dry and sweat-free, you’re going to have a much better experience out hunting.